With Sai Pallavi’s popularity chart rising, her film Malayalam is being dubbed in Telugu. Sai Pallavi is not the only reason to release the film in Telugu, Dulquer Salman is also a known face in Tollywood. He got famous in Tollywood with his film Ok Bangaram which released in 2015. The dubbing process of the film is currently in progress and the makers are planning to release the film in September. 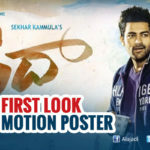 The film’s title logo was unveiled today by director Sekhar Kammula and It is DV Krishnaswamy’s production. Dulquer will also be making his debut in Telugu cinema with Mahanati, a biopic on legendary actress Savitri, his market in the Telugu states seems to be much higher. On the other side, Sai Pallavi is busy with her 2nd Telugu film MCA opposite Natural star Nani.